Grinders are an essential tool to have when it comes to preparing cannabis. While many are geared toward you using them in your home, sometimes you might want to use your grinder on the go. However, many grinders tend to be bulky and heavy which can make carrying them around a little awkward and uncomfortable. If only there was something that could help with this. The good news is there is something. There are plenty of small grinders you can transport around without them being uncomfortable or difficult. These grinders can fit into your pocket so you can use them discreetly anywhere. This article will highlight some of the best small grinders available today you can buy as well as some helpful tips to keep in mind before you invest in one. Small grinders are exactly what their name implies, they’re small versions of larger sized grinders. Because of their size, it makes it easier for you to transport them around unlike larger models. Because of this, they’re ideal for those on the move. Small grinders contain the same features as larger grinders and work the same as well. The lids are usually magnetic, they have numerous sharp teeth, pollen screen/chambers, and kief storage. The only difference is their size. Small grinders have plenty of features and benefits! Here are just a few of them. One of the best things about small grinders is that they’re portable and compact. This makes them great for people who want to carry them around. Because they are small they are extremely lightweight which helps to make this possible. These products are also very compact so they won’t take up much space in your pocket, bag, or whatever thing you decide to put them in. Small grinders are easy to clean and are small enough that the cleaning process will only take a few minutes. This makes them ideal for those who don’t want to spend much time cleaning their grinder out. These products sometimes come with pollen scrapers and brushes which can help you to get into crevices that would otherwise be difficult to clean. These scrapers and brushes help to add to the durability of the grinder so that it lasts. A great thing about small grinders is that they’re affordable. This is mainly due to their size, but don’t let the low price tag fool you. Small grinders work just as well as larger grinders but come at a more reasonable price. So, if you’re looking to invest in a grinder for the first time it might be a good idea to start out with a smaller one which tends to be cheaper. When some hear “small grinder” they might think of these as only being a 2 piece product. While some are, most are 4 pieces like many larger grinders. This means they can do the same work as larger grinders, like sort through pollen, but just do so in a smaller space. Grinders might seem like they’d be very loud when in use, and while some are, many small grinders aren’t. They are designed to be quiet so you can use them discreetly. The grinder won’t make annoying noises when you twist it around which makes it perfect for those who want to use their own in many different places. Small grinders are great because they each come in a variety of compact sizes. You can find ones that measure 2 inches and ones that measure 2.5 inches. This means you’ll be able to find a small grinder that will work well for your needs. It might seem like creative designs wouldn’t be possible with these types of grinders, but they are. Small grinders come in plenty of amazing styles and designs. You can find ones in beautiful color palettes to ones that have one-of-a-kind artwork etched on them. You’ll have plenty of options when shopping for small grinders which is a great feature about them. Unlike if you were tearing the cannabis leaves up by hand, grinders work to keep the contents fresh even a few days after having grounded them up. This means you can store them in the grinder for as long as you need to without wasting any of it. Grinders are also able to help keep the cannabis fresh because it grinds it up well. Most of the time the cannabis will be grounded evenly and finely with the grinders which helps to keep it fresh. If you were to do this by hand the contents probably wouldn’t be as evenly and finely grounded. Some grinders even have clear compartments so you can keep an eye on the contents as they stay stored inside. One of the best benefits about these products is that they’re quick and easy to use. If you were to grind the contents up by hand it might take a while because it takes a lot of energy to do so. However, grinders work to accomplish this quickly. All you have to do is fill the grinder up, twist its lid around, and remove the contents inside so you can use them. It’s that simple. Many also have grips built into the side of them which can help you to keep your fingers secure on the grinder so they don’t slip. These grips are comfortable to hold and can help to make twisting the lid much easier and quicker because you don’t have to keep readjusting your grip. Small grinders usually come with either 2 or 4 chambers. A 2 chamber grinder only has one compartment which is where the grounds are held. It’s the simplest type but it doesn’t have the best cuts and there’s no kief catcher in them. A 4 chamber grinder has 3 compartments inside which work to completely sort through all the grounds. It uses screens and filters to help remove the pollen and kief from the mixture so you can use them. This type helps to give you fine grounds but it can be a little more difficult to clean compared to a 2 chambered grinder. Because of this, you’ll want to keep these two differences in mind to ensure you invest in the one that’s the best for your needs. Many small grinders have a kief catcher built into them. So, what exactly is this? A kief catcher just collects the kief, the small crystals in the cannabis, from the contents you put into the grinder. This catcher uses screens to help keep anything besides kief out. A kief catcher is ideal if you’re looking to use the grounds for baking or for high THC levels. While small grinders have many benefits they also have a few drawbacks. One is that they don’t hold as much cannabis as larger grinders can. If you’re looking to get a large amount of grounds you’re best off investing in a larger grinder. Another thing to consider is that smaller grinders can be a little difficult to use at first. This isn’t to say that they are completely unusable, but because they are so small it might be difficult to keep your grip tight and steady when you’re twisting the lid around. You’ll want to keep this in mind so you aren’t surprised if at first it’s a little difficult to use them. The Homasy Small Grinder measures 2 inches and is made up of 4 pieces. It’s made out of a durable zinc alloy housing that’s covered in a sleek black finish. Inside this small grinder are 54 teeth – 30 on the top and 24 on the bottom. This setup helps to make grinding the materials quick and easy. As the teeth work to grind the materials up, they will fall through the grinder’s pollen screen which will sort through any pollen in the mixture so it’s removed. At the bottom of this product is a kief catcher which stores the kief and keeps it fresh until you need it. This model is easy to clean and comes with a pollen scraper to help you scrap the pollen off the pollen screen. The Jujunx Small Grinders are extremely small models that measure only 1 inch across. These are very affordable which makes them ideal for someone looking to invest in a somewhat cheap grinder to transport around. 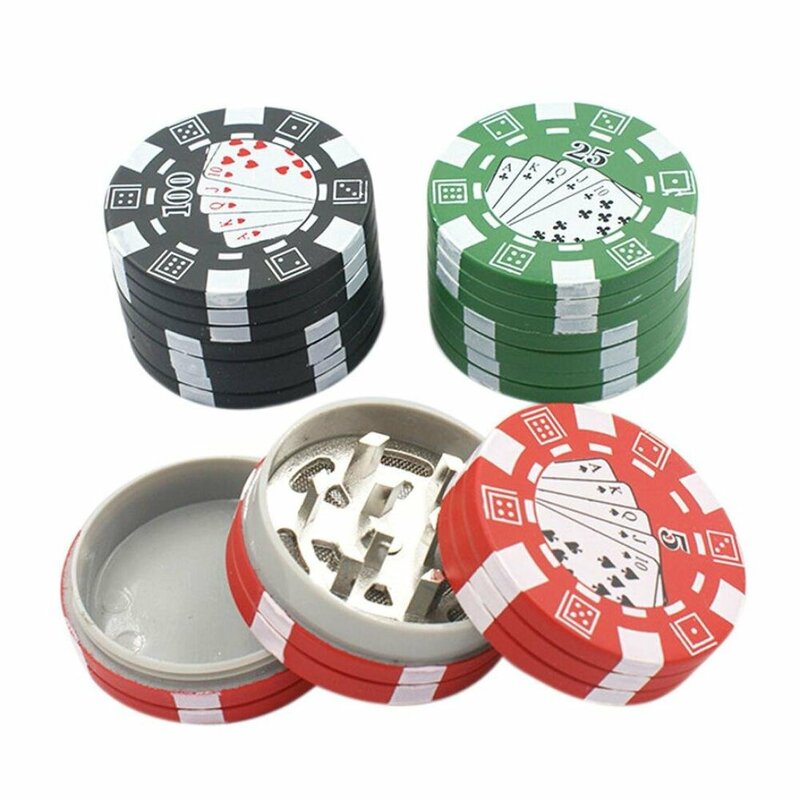 These grinders come in 3 different colors: green, black, and red. They are made out of 3 pieces which includes a lid, teeth, and collection chamber. The Valasea Grinder measures 2.5 inches and is made up of 4 pieces. It features a stylish design with a black housing that has a golden twisting figure on the top of it. The housing is made of a CNC aluminum which is sturdy and durable so it won’t break or scratch easily. Inside the grinder are interlocking teeth which are sharp and quick at grinding the materials inside up. The interlocking feature also helps to ensure that the materials are grounded up evenly so your mixture doesn’t have large chunks in it. After the teeth have ground the contents up, the contents will fall through a pollen filter which will work to remove the pollen from it. Then, it all will fall into a collection chamber where it can be stored until you need to use it. This collection chamber is designed to also keep your grounds fresh so they aren’t dried out when you go to use them. When it comes time to clean the grinder you can easily do so thanks to a pollen scraper that comes with it and its removable pieces. The GSTAR Small Grinder measures 2 inches and comes with 4 pieces. It features a sleek gunmetal finish and is perfect for those looking to grind up very small quantities. The interior of the grinder has numerous sharp teeth which help to grind the materials up quickly. The contents will then fall through a 500 micron screen which will sort through the pollen and large pieces of the mixture so your grounds are fine and even. The lid of the grinder features magnets in it which help to keep the lid on the grinder safely when you twist it around and help to prevent smells from escaping. This affordable product is easy to use and compact so you can easily store it away discreetly in your pocket or bag. 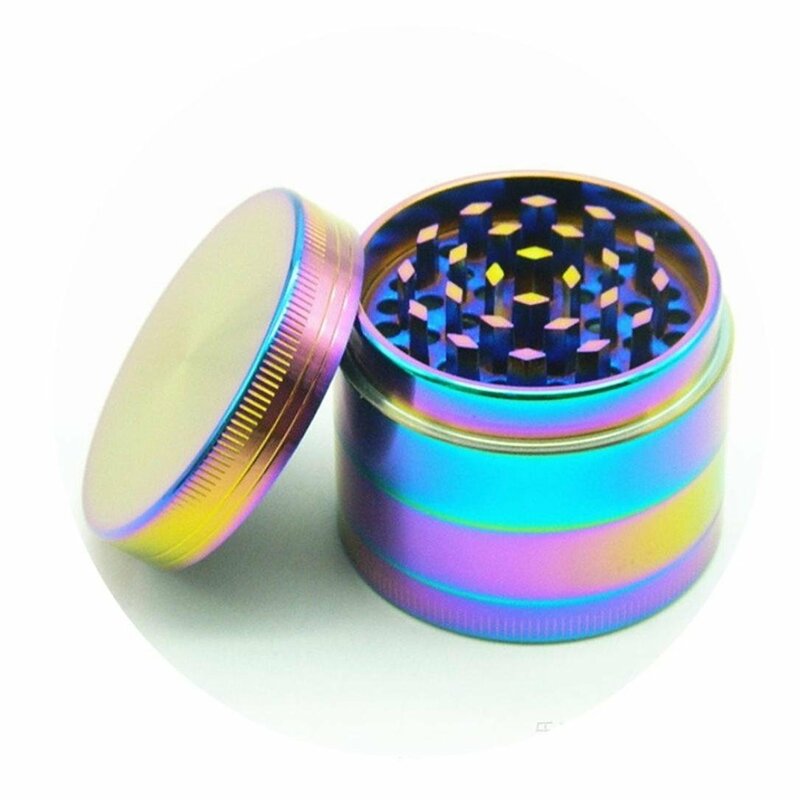 This small grinder by Jujunx is made with a very colorful and shiny design. It features a pastel mixture of colors on its aluminum housing and is anodized so this color assortment doesn’t scratch off easily. This product is made out of 4 pieces. One piece is the lid which features strong magnets in it. These magnets work to keep the lid secure to the grinder which is a great safety feature when you’re twisting the lid around. The lid also features a poly ring which helps to give you a smoother grind so it’s easier to turn the grinder around. Inside the grinder are sharp teeth as well as a stainless steel pollen screen which helps to sort through the grounded contents. This is a very affordable model which makes it great for those who are just looking to start their small grinder collection. 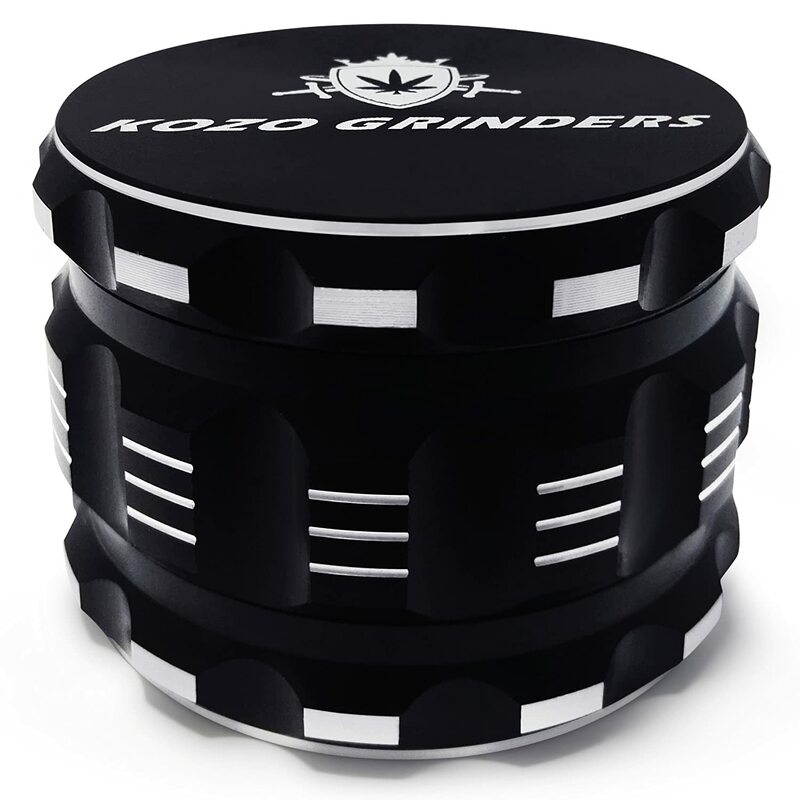 The Kingfly Grinder is made out of a silver zinc alloy housing and is designed with a unique concave design which helps you to keep your grip better on the grinder and helps the teeth inside to grind the contents more evenly. 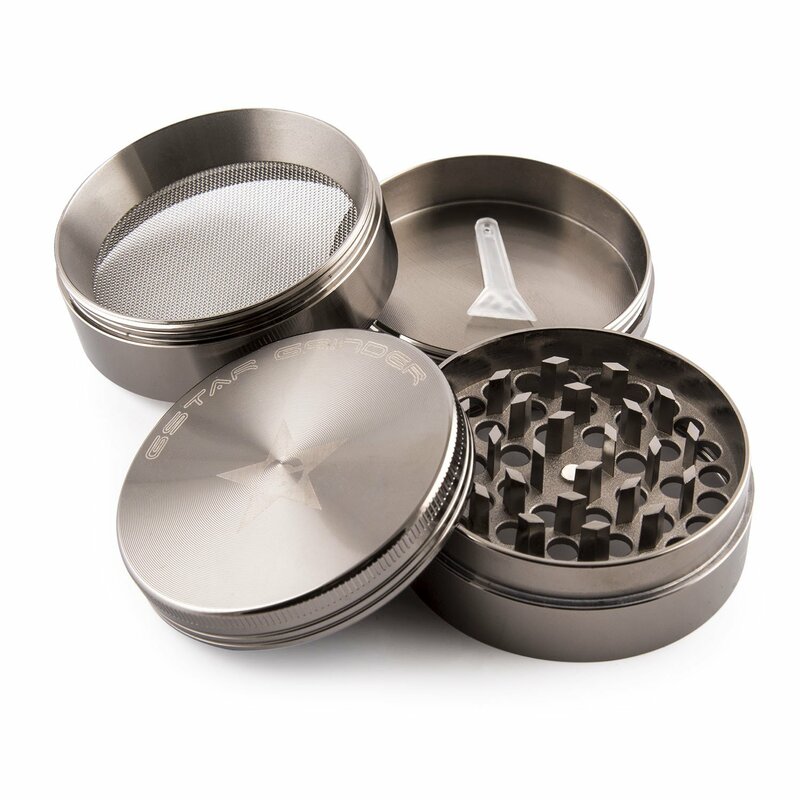 This 4 piece grinder measures 2 inches and is very compact so you’ll be able to carry it around easily. The interior of the grinder has many sharp diamond-shaped teeth to help with grinding the materials up which will then be sorted through its strong screen filters. The grinder has a threaded catch basin which will store the contents until you need to use them. The lid of this product has magnets built into it which helps with making it easier to twist and keeps it quiet when in use. This small Kingfly grinder comes with a pollen scraper to help you keep your grinder clean. This Golden Gate grinder measures 1.5 inches and is made up of 4 durable pieces. It is made out of an anodized aluminum that’s covered in a silver finish. The grinder’s lid features strong magnets inside and a screen to help sort through the materials. The grinder’s teeth are extremely sharp which helps to make grinding quick and gives the contents inside a very fine grind. While this tends to be a little more expensive compared to other small grinders it’s quite durable so it will last a long time. It’s also very easy to clean and comes with a pollen scraper to help with this. 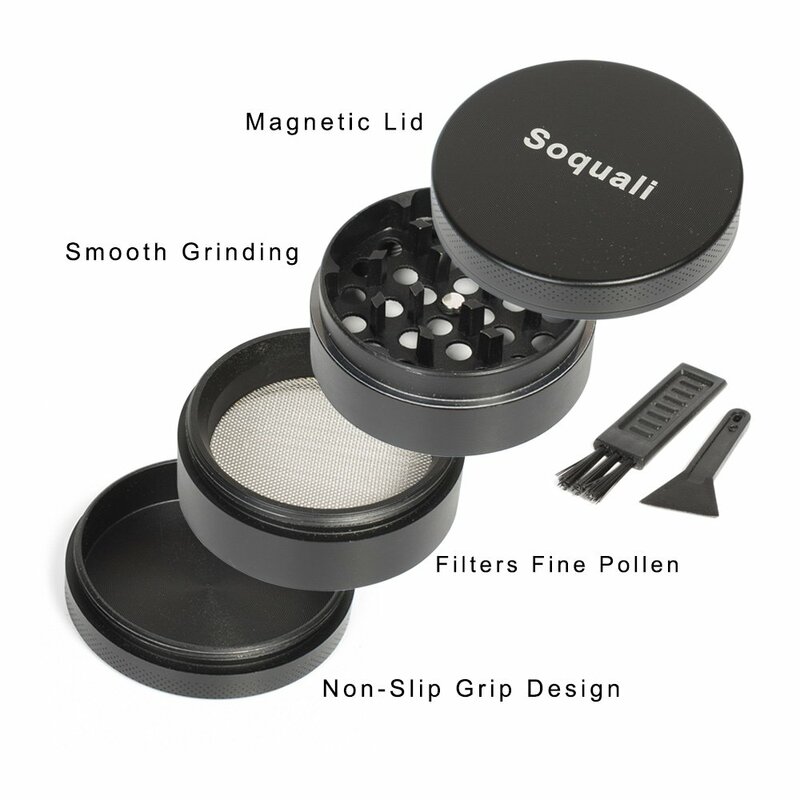 The Soquali Studio Small Grinder is made with a sleek black design and features 4 pieces. It measures 2 inches long and has a magnetic lid to help keep odors from escaping and the contents inside fresh. 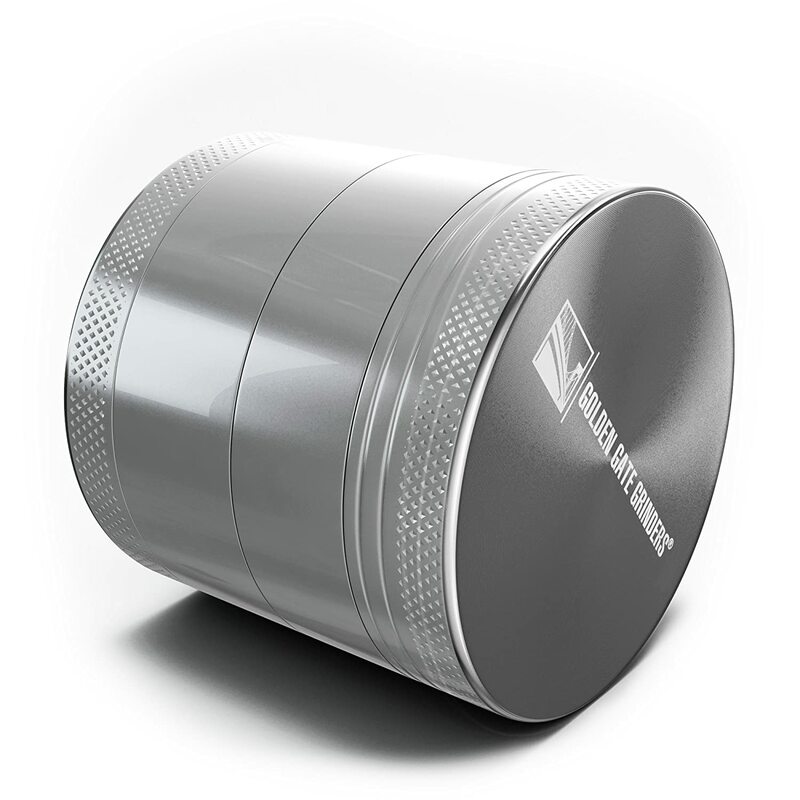 This compact grinder has many sharp diamond-shaped teeth which work quietly as they finely grind up the contents inside. There’s also a kief catcher on the bottom which will help to store the kief away and keep it fresh until you need to use it. This grinder comes with a scraper and brush you can use to clean it. 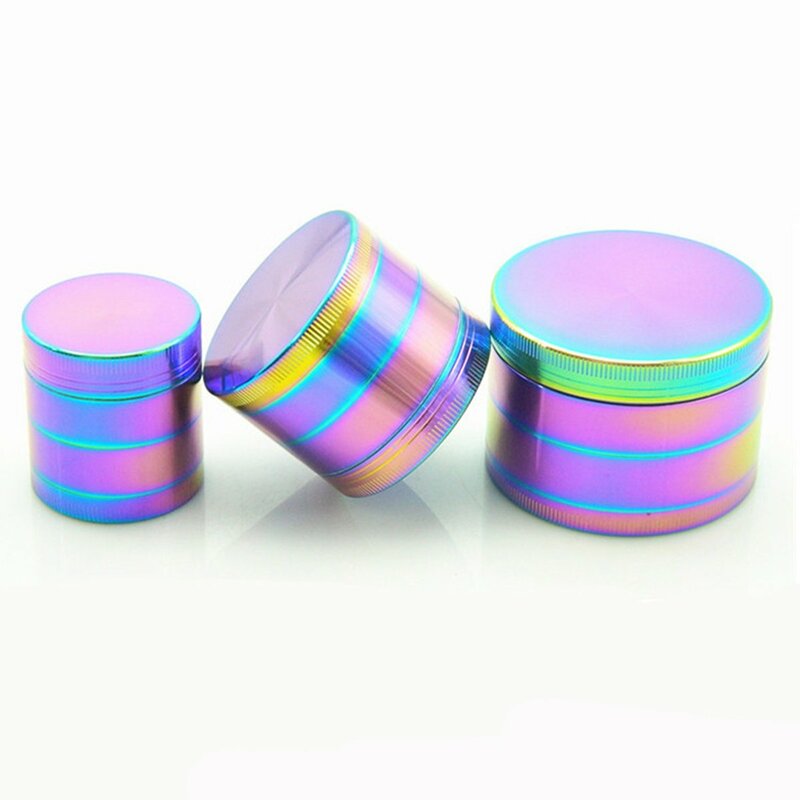 The Night-Gring Grinder features a stunning colorful rainbow design on its zinc alloy housing which is sure to make your grinder stand out when you showcase it. This 4 piece grinder measures 1.5 inches and comes with sharp teeth to help grind your cannabis up. It also has a sturdy sift screen built into it which helps to sort through the materials being grounded so that they are fine and even. This grinder might be small, but it’s extremely durable which means it will last. This product comes with a pollen scraper to help clean the screen off. This LakeMono Grinder is a small 2.5 inch grinder made up of 4 pieces. It features a blue finish on its aircraft aluminum housing which is durable and won’t scratch or break easily. On the top of the grinder is a magnetic lid which helps to keep your grip steady on the grinder as you twist it. The magnets also help the lid to stay tight on the grinder so the materials inside stay fresh and odors don’t leak out from it. The interior of the grinder features many sharp teeth to help quickly grind up the materials inside. These teeth work quickly and are also quiet so they won’t make annoying noises when in use. As the teeth work to ground the contents up, the cannabis will fall through a pollen screen and catcher to help sort the pollen out. Any pollen found will be stored in the pollen catcher which you can later remove. 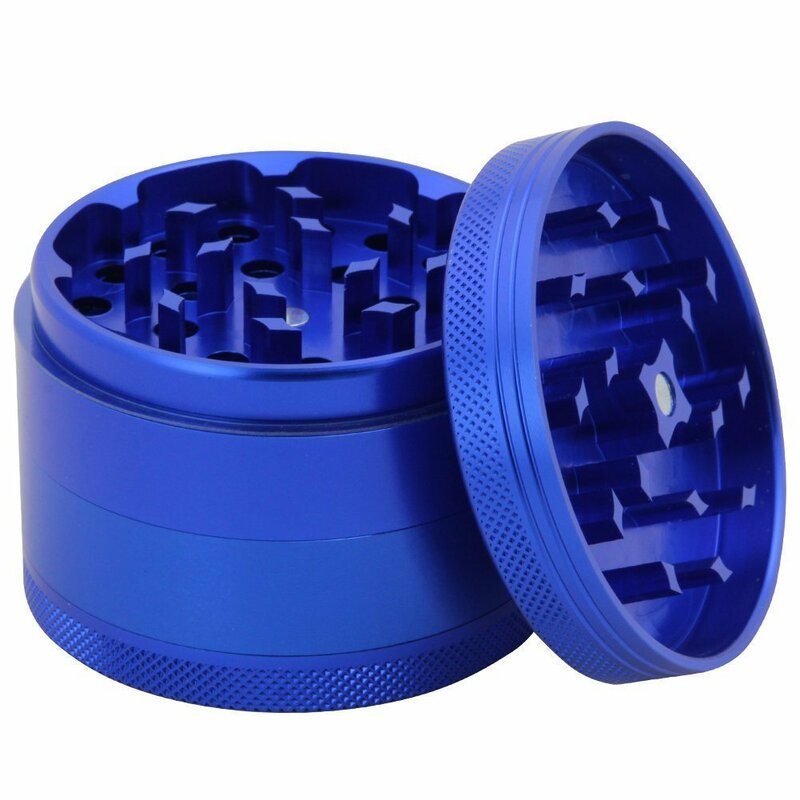 This affordable grinder also comes with a pollen scraper to help you clean off the pollen screen when necessary. The DCOU Small Grinder measures 2.2 inches and is made up of 4 pieces. 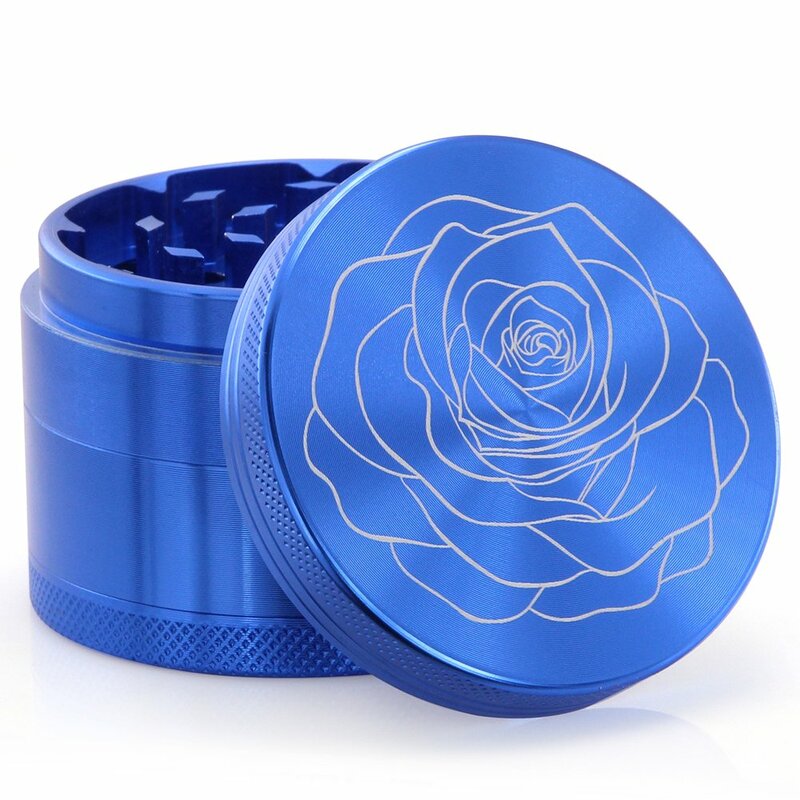 It’s crafted out of an aircraft aluminum which has a stylish blue finish and a laser flower pattern etched into the top of it. 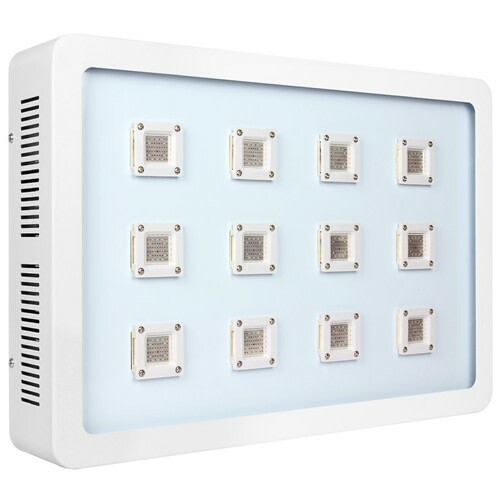 This housing is quite durable and scratch-proof so you won’t have to worry about it being damaged easily. 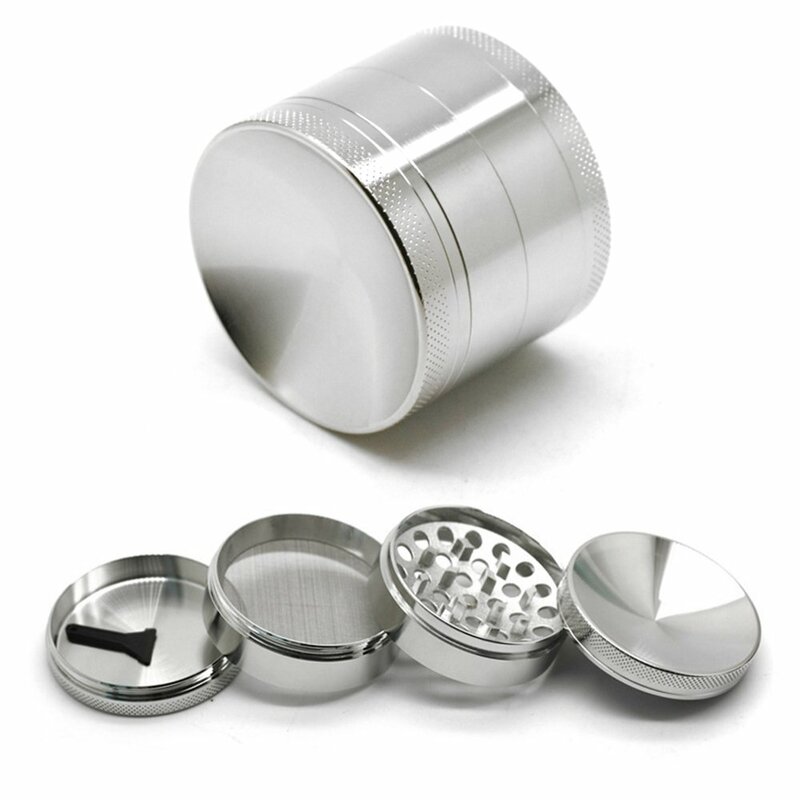 This grinder features a magnetic lid to help keep it secure on the top of the grinder when you twist it around. Also built into the lid is a poly ring which helps to make moving the lid around easy and helps the teeth inside working to smoothly grind the materials inside it up. Inside this grinder are also 3 chambers which sort through the contents like filters and pollen chambers. 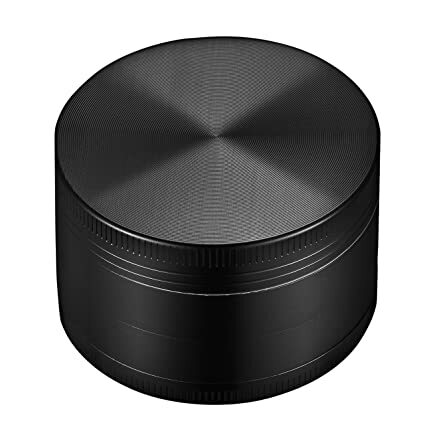 This small Kozo grinder measures 2.5 inches and features a black aluminum housing that is both durable and scratch-proof. The housing has special grips built on it to help you keep your grip steady while you turn the lid around to help grind the cannabis inside up. The teeth inside this product are very sharp and work quietly. As the materials are grounded, they will fall through this model’s mesh screen which will work to filter them. There is a kief catcher as well in this grinder which will remove the kief and store it away in a separate chamber until you need to use it. 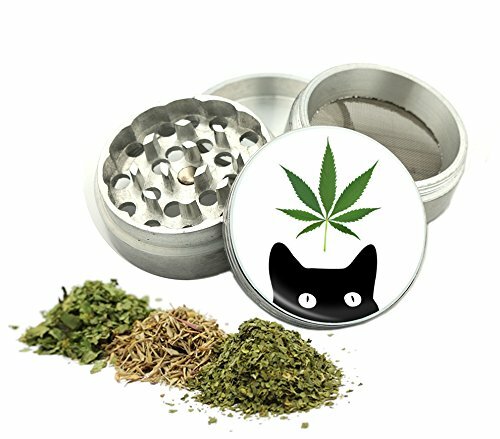 The WeedCat Small Grinder is made up of 4 pieces and measures 1.5 inches. It’s made of a silver aluminum housing that features a creative art print of a cat peeking out from the bottom of the lid. 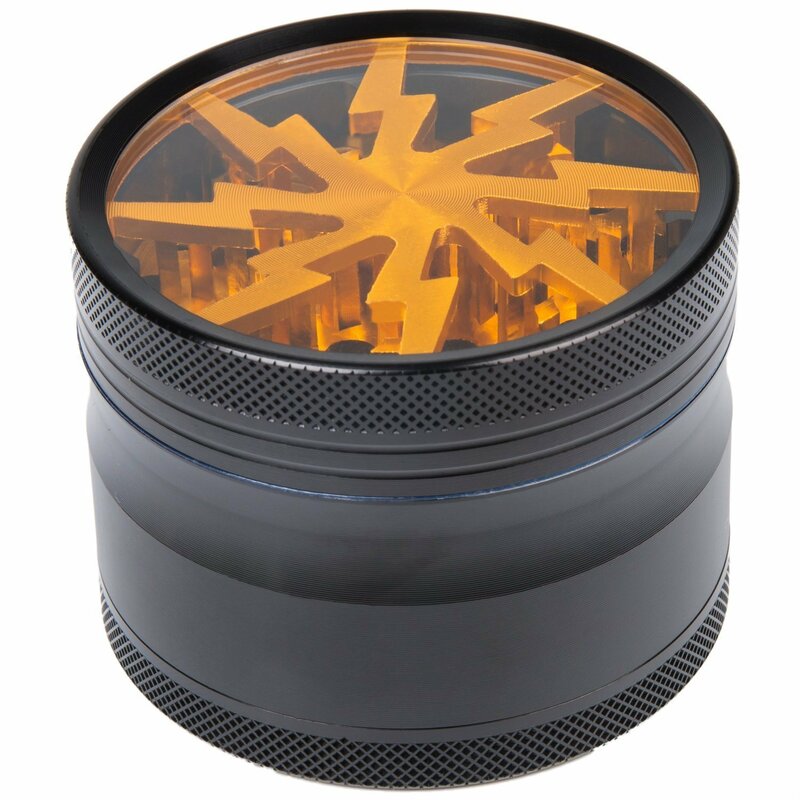 This grinder is also made with a clear doming which adds a unique design aspect to it. Inside this grinder are sharp teeth which get to work quickly grinding the contents inside up. These teeth are sharp enough to help give you a fine grind which is ideal. The contents will be sorted through a special screen which will help to remove unwanted pieces from them. Many might think they need to invest in larger grinders in order to have a fine grind with their cannabis, but this isn’t the case. Small grinders might be compact but they often work just as well as larger models. If you’re on the go and want to be able to take your grinder around with you, you’ll definitely want to consider using small grinders, especially the ones mentioned above. They’re affordable, easy to use, and work quickly which makes them ideal for everyone to have on hand.